Gujarat tribal leader's arrest under PASA: Civil society unites to demand "immediate release"
The organizations which signed the statement include Jamit Adhikar Andolan Gujarat (JAAG), with has fought many a battle across Gujarat against “indiscriminate” land acquisition in special investment regions (SIRs); Jan Sangharsh Manch (JSM), founded by well-known radical trade unionist and lawyer, late Mukul Sinha; apart from several others which operate in the state's tribal areas, including Lok Sangharsh Morcha, Adivasi Ekta Ane Vikas Parishad, Bhilistan Vikas Morcha and Bhilistan Tiger Sena. The statement was issued following a joint meeting of these organizations, which, among other things, decided to hold a major tribal rally on February 19 in Vyara, district headquarters of Tapi, in protest against the arrest of Gamit. An earlier attempt for holding the rally in Chhotaudepur, planned for February 2, could not succeed, as the district was declared “terrorist prone” to halt any move of protest, and curfew was imposed in all its blocks till February 14. The statement comes following Adivasi Kisar Sangharsh Morcha (AKSM) chief Romel Sutariya's strong appeal to Gujarat civil society to take up the case of Gamit, arrested in January-end ahead of a major protest planned by AKSM in Chhotaudepur, the arrest, say activists poses a “major challenge” to those who are fighting on a radical platform. Following the arrest, Gamit was taken to Rajkot, 400 km away. Meanwhile, the AKSM has issued a notice to the district collector, Chhotaudepur, saying that the protest on February 2 was not allowed and curfew imposed as it would have “fully exposed Gujarat's so-called development model.” A copy of the notice has been sent to the Gujarat chief minister, the director-general of police and the state home secretary. The AKSM said, “The order was violative of the Forest Rights Act (FRA), 2006, which gives tribals specific rights over the natural resources in forest areas. By this order, the Gujarat government has acted under the colonial 1927 law for forests, which is unacceptable”, the notice reads. “We feel that the a sand mining mafia is at work and is working at cross purposes with the FRA. 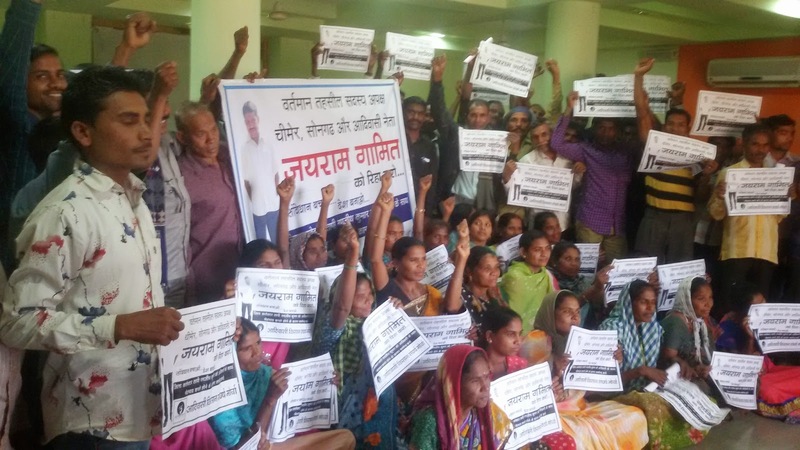 In village Ambala of Chhotaudepur district, there have been cases of officials' harassment of tribals who protested against sand mafia seeking to mine water bodies. We demand a complete inquiry into the manner in which on December 10, 2014, the forest officials beat up tribals and instituted false cases against them”, the notice reads.